Case B Manufactured Assignment showing alleged forged signatures by Citibank representatives signing on behalf of MERS and proven forged Notary signature. Copy of Jaime Hardcastle's Authentic Signature on his personal residence Deed to Secure Debt. State of Missouri Dennis Lueke Official signature and Public Oath of Office filing from Secretary of Stateshows notary signature and no corporate seal. 5 Doc Article: Lender Processing Service (LPS) closed the offices of its subsidiary Socx, LLC in Alpharetta, GA.
Case C Manufactured Assignment showing another alleged forged signature of the same Jaime Hardcastle present on the Assignment of Mary Ann Houser Tavarez. Copy of Jaime Hardcastle's Authentic Signature. 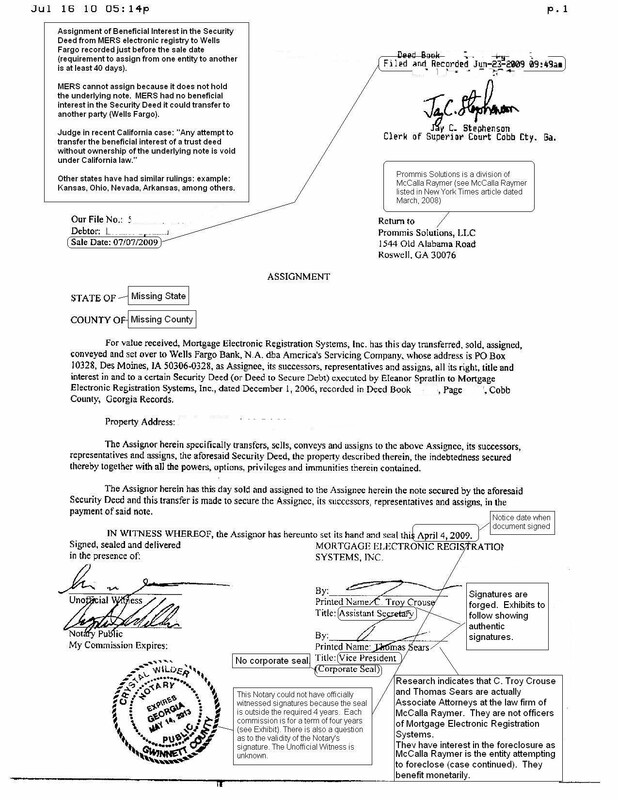 Case E Manufactured Assignment showing alleged forged signatures by foreclosure attorneys signing as representatives of MERs. Notary signature allegedly forged. No Corporate seal. Case A Manufactured assignment showing alleged forged signatures by foreclosure attorneys signing as representatives of MERS. Notary did not witness. Assignment filed just pior to sale date. Screen print of McCalla Raymer webites showing Associate Attorneys' name. The documentation enclosed is intended to educate recipients about the criminal activity occuring within the foreclosure process. This study was initiated after borrowers were foreclosed on during the trial modification period, short sale processing period, and modification processing period. It has been observed borrowers responsibility requested accounting verification, made proper and regular payments, and filed correct paperwork for processing. Yet, the foreclosure prodeeded, robbing the borrowers of due process. It has also been observed that judges are not requiring the foreclosurs entities to produce proper documentation, and the foreclosure process is being allowed unchecked. It is this writer's hope that the provision of this information will cause change and accountability within the courts, the mortgage servicing companies, and the attorneys and processors in the default management functions.